For a blank sheet of paper, we thought this one was pretty interesting. 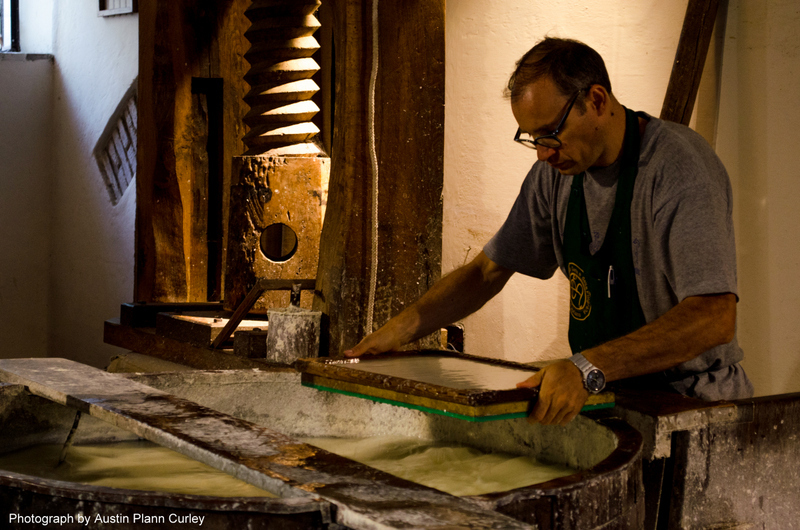 But before we get to what exactly it is, let’s refresh our understanding of how paper is made. In the mill a vatman dipped the mold and deckle (an open wooden frame that paired with the mold) into a tub of pulp, scooped out a slurry, and shook the mold to form an even layer of entangled fibers as water dripped away. The fresh sheet was transferred to a blanket of felt by removing the deckle, flipping the mold upside down, and pressing it against the felt—a process known as couching. 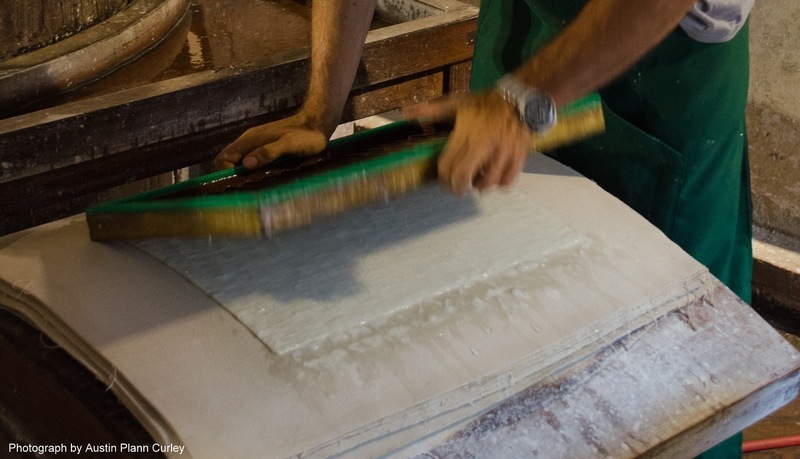 One of the fascinating things about handmade paper is that it records such great evidence of the papermaking process. Wire marks from the laid and chain lines become visible with transmitted light. The surface of the handmade sheet even retains a hairy texture imprinted from the felt, and occasionally, even a rope mark from drying. The subject of this month’s crocodile shows all the hallmarks of early modern paper, but what are those heavier horizontal wire marks? Fittingly, this mysterious paper comes from the endsheets of a 1624 imprint of Cryptomenytices et cryptographiae libri IX. 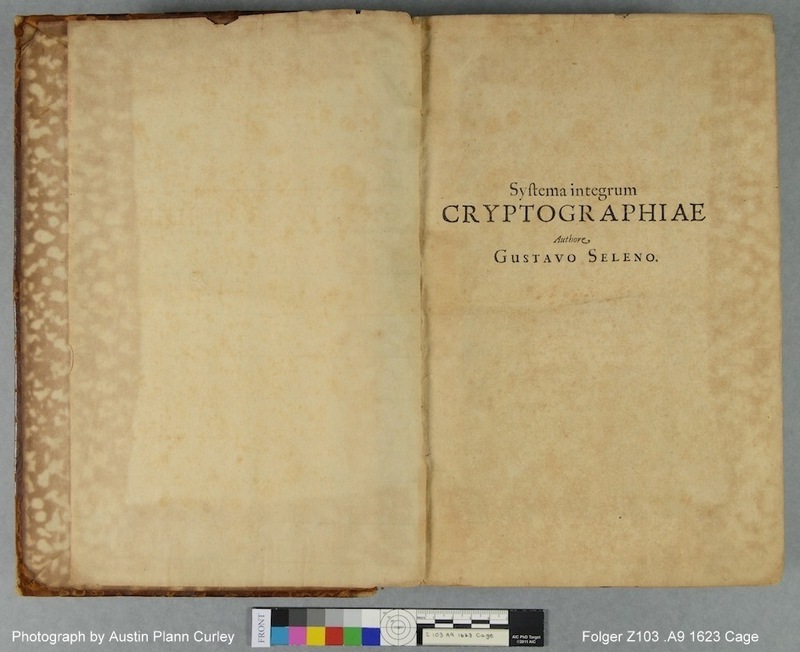 The book was included in the recent Folger exhibition, Decoding the Renaissance: 500 Years of Codes Crypts and Ciphers, and the gridded paper was noticed when the book was being examined by the conservation department. No one in the lab had seen paper like this, and we were curious to know its intended purpose (which was surely not to serve as endleaves!). Some of our initial thoughts were the same ones suggested last week in the comments. Maybe the grids were registration marks for printing, or guide lines for writing. It was common for medieval and early modern account books to be marked with blind lines for margins and lines of text. But the wire marks in our paper were barely visible in normal light. Or perhaps grids were left by “tear-wires” in the mold. This would make sense if the paper was intended to be torn into small squares, for example as stamps or seals. Paper with gridded wire marks is certainly unusual, but after some email exchanges with colleagues at other institutions, we learned that similar sheets do exist. 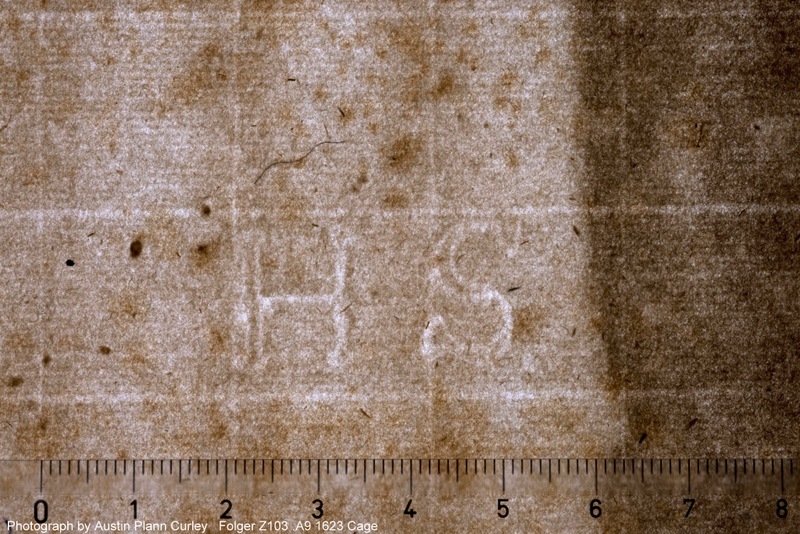 Historian Peter Bower reported encountering paper with a gridded wire mark in an 18th-century sketchbook of Jean-Joseph Chamant (1699–1768), a French architect who traveled widely in Europe. 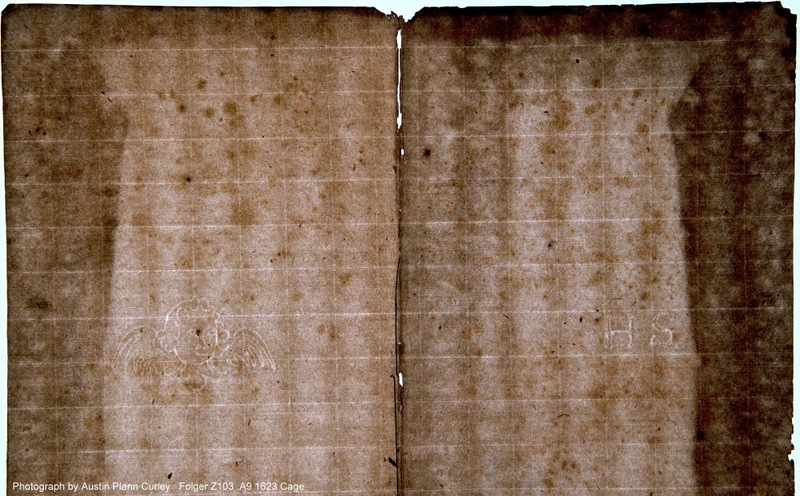 The Chamant Sketchbook belongs to New York University’s Villa La Pietra, in Florence, Italy.2 A watermark in the sketchbook indicates a paper made within the Holy Roman Empire, territory that includes modern-day Germany, Belgium, Switzerland, and the Netherlands, as well as portions of neighboring states. The Folger sheet has a watermark too. 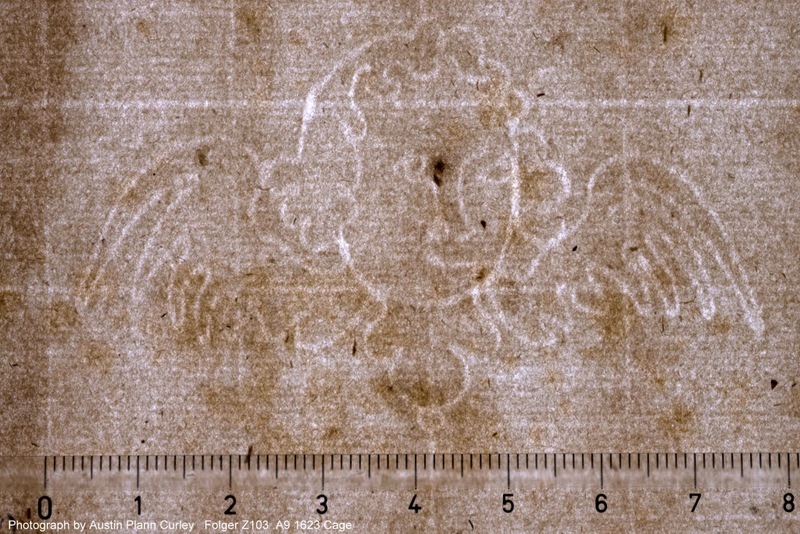 On the left is the head of a winged cherub, and on the right, a countermark reads “HS.” This watermark did not turn up in our familiar databases, but Andrea Lothe at the German National Library recognized it from her own library. She alerted us to a 1704 manuscript from Wernigerode Castle in Germany and speculated that the paper was made locally. Our book was printed in Lüneburg, just 115 miles north of Wernigerode. Frieder Schmidt, paper historian at the German National Library, was also aware of such papers and mentioned a 1942 article, “Zeilenpapier” in the journal Buch und Schrift. The German name for this type of wire mark is “gegittert,” and there are in fact several patents for gridded papermaking molds, among them one of these was issued in 1824 to an Austrian schoolteacher who provided the gridded paper his pupils for penmanship. We are still hoping to learn more about this unusual paper and we welcome comments from anyone who has encountered it. Thanks for your thoughts! AUSTIN PLANN CURLEY is a graduate intern in the conservation department at the Folger Shakespeare Library. He is completing his third year in the Winterthur/University of Delaware Program in Art Conservation. Edit June 20, 2016: Clarification of the location of the Chamant Sketchbook; many thanks to Morgan Adams, a conservator at Columbia University Library. Morgan Adams, Conservator for Special Collections at Columbia University Library, treated the Chamant Sketchbook as a post-graduate fellow at the Morgan Library. She wrote about the treatment in The Common. What a great and informative blog post; thank you! I will keep an eye out for paper with gridded wire marks in our early printed books at the Lilly Library! Could the grid of the paper relate to the content of the book, “Cryptomenytices Cryptographia” ? It would be pretty awesome if those endleaves were bound in for use as cyphers! If I am remembering it right, it looked like there was a full bifolium of the gridded paper missing from the front of the book (double endleaves in the rear but just a single in the front). Maybe it was taken out for that reason – I would like to believe it! What a grand story—Umberto Ecco and Dan Brown material! I imagine the Duke could have well enjoyed working with the papermaker to printer to fashion a book incorporating his theories–spycraft embedded within bookcraft. With the caveat that it is dangerous to make generalisations based on photographs of single sheets I offer the following observations! Short fibres are present in the pulp as evidenced by the shadowing on the chainlines & the clarity of the water mark. There does not appear to be any entanglement of longer fibres on the thicker horizontal laid lines.ie picking. There is no evidence of back wash at the thicker laid lines which implies the shake was minimal. The cherub watermark has been designed & positioned correctly to ensure it is anchored firmly to the face.. The texture is NOT & the felts seemed to have been in reasonable condition. The paper looks as though it has been very well sized with gelatine & has bulked up as a result. The waterleaf sheet was probably quite thin & this is why the thicker laid lines are so obvious after gelatine sizing. The mould face has been deliberately designed from the beginning of its construction . This strongly indicates there was a specific reason for doing so. This could be for reasons relating to mould construction &/or availability of materials eg sufficient wire of the correct gauge, easier mould/ paper identification within the Mill, or because the paper had a specific use. The fact that a regular grid pattern was established may or may not have been deliberate since the rib spacings could have been influenced by other construction factors. Like others, however, I believe that the face has been designed to aid the use by the customer. It could have been for a specific use by a limited number of customers ie made on a limited basis which is why not much has survived or somebody had a bright idea but because it was comparatively difficult to achieve consistent results during manufacture it never became a mainstream paper. What would be very interesting is to see what happened to the thicker laid lines at the edge of an untrimmed sheet.